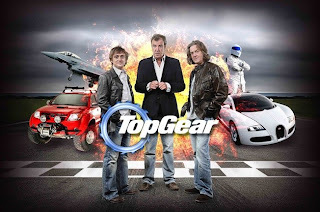 Top Gear is a British car magazine show - except it's less about cars (much as they do feature quite heavily) and more about celebrating the great British traditions of making fun of absolutely everyone and messing about a lot. In cars. Now, if you follow me on Twitter (@ClassicalJG) you may know that I'm a big fan of Formula One. (Since I am also a big fan of Ron Howard, Daniel Bruhl and Chris Hemsworth, you can just imagine how excited I am about the upcoming movie Rush). I also have a peculiar conviction that Formula One and Roman chariot racing were extremely similar. Both feature drivers who race for themselves and for personal victory, but who are also members of a team, and must obey team orders and act in the team's interests as well as their own. Both are extremely dangerous, but not (usually) actively violent. Both involve going round in circles very very fast in a small, wheeled vehicle. The main difference, really, is that Roman circuses were in the shape of flat versions of NASCAR tracks, whereas Formula One uses more interesting irregular circuits (though this has the side effect that the live audience only actually see cars whizz past one at a time in front of them on the patch of track they actually have a view of). Well, that and a Formula One car won't kick you if you mis-treat it. All this being true, it will not surprise you to learn that one of the daft things I would really love to do is race round a Roman circus in a car. Poking around watching clips of old episodes of Top Gear this week, lo and behold, what did I find? http://www.youtube.com/watch?v=MI1BkOtH8Gs (It's impossible to embed this video for some reason). Yep. That's the Top Gear team basically living out my fantasy. The music, by the way, is the Ben-Hur soundtrack for the introductory bit and the Gladiator soundtrack for the racing section. I'm sure, as person who works closely with archaeologists and those involved in heritage management, I should probably be horrified at this clearly somewhat dangerous behaviour in an important archaeological site. And yet... no, I can't be horrified, because given the chance I would do exactly the same, and have a whale of a time in the process. Brilliant and awful at the same time. But it shows why the Romans needed "sparsores" or "sprinkly boys" who would run onto the track (sometimes DURING the race) and sprinkle the sand with water to keep the dust down. Needless to say there were casualties! Check out my book, The Charioteer of Delphi! And the audiences came to both for the same reason: the off chance that someone would die in a horrible way.